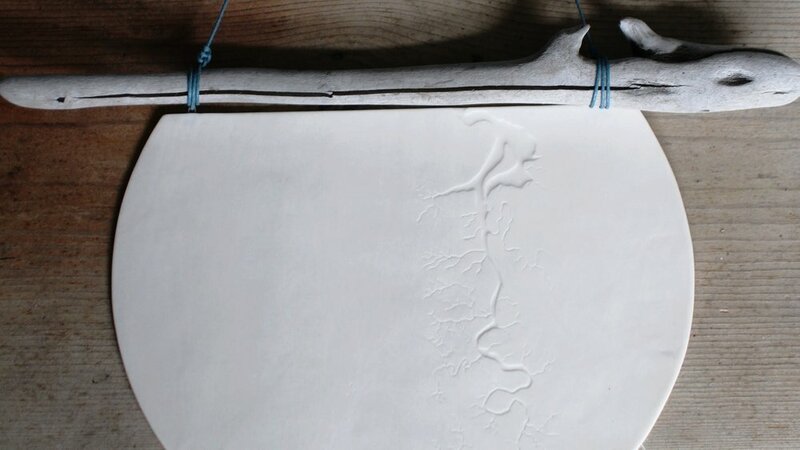 Oxbow makes maps in porcelain that explore our human connection to water. Lighting and tableware, featuring places you know, places you rely on, places you love. Pacific Northwest focused, though custom inquiries are welcome. With every drop of water you drink, every breath you take, you’re connected to the sea. No matter where on Earth you live. I typically work in small batches and email subscribers are always first to find out when new work is available. Find me in Seattle at the Northwest Art Alliance's Best of the Northwest Art and Fine Craft show in Hangar 30 at Magnuson Park. The NW Art Alliance uses this as a fund raiser for their year-round work promoting and serving local Pacific Northwest artists. It will be the 30th anniversary of their fall show, and that history is reflected in the atmosphere of the show - it's a little more formal than my usual haunts, and artists present a wide range of work. I'll be working on a couple of bigger pieces just for this! Join me and other handmade vendors in the belly of the beast at Westlake Park, downtown Seattle, offering local options on the biggest shopping day of the year. The Holiday Market at Westlake Park is one of several shows curated & hosted by Urban Craft Uprising. Westlake Park, 12:00 - 5:00, Friday through Sunday, 11/23-25. Olympia’s weirdest craft fair, set up in the seats of the local theatre. Capitol Theatre, 11:00 - 4:00. A small and sweet collection of artists, gathered at the Knitting Mills’ artists collective.